The Vatican's Secretary of State made a dramatic revelation ahead of Pope Francis's visit to Israel next Sunday and Monday, declaring that the pope will talk about the "Palestinian people's right to have a homeland, sovereign and independent." Cardinal Pietro Parolin holds a role in the Vatican City State, located in the Italian capital of Rome, equivalent to that of a prime minister. Speaking to Vatican television on Thursday, he said "we know that the pope is going to a particularly suffering land," reports AFP. "I really hope that the fruit will be to help politicians and all people of good will take courageous decisions on the path to peace," Parolin stated. 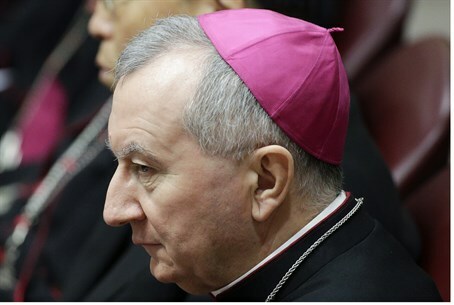 When asked what the pope particularly intends to talk about during the visit, Parolin revealed he would talk about "on the one hand, Israel's right to exist in peace and security within internationally recognized boundaries." On the other side, the pope would talk about "the Palestinian people's right to have a homeland, sovereign and independent, the right to move around freely, the right to live in dignity," according to Parolin. In fact, the Vatican recognized the "State of Palestine" in 2012 amid the United Nations (UN) vote to confer "Palestine" non-member observer state status, a status until then only held by the Vatican. Despite the pope's insistence that his visit is "religious not political," his decision to begin his trip from Jordan directly by helicopter with a stop in Palestinian Authority (PA) controlled Bethlehem has been greeted by Arab sources as a move to "recognize Palestine" and help "end the occupation." Rabbi Sergio Bergman, a member of the Argentinian parliament and close friend of Pope Francis, reported in February that the pope intends to define himself as the "Che Guevera of the Palestinians" and support their "struggle and rights" during his visit. It has been noted that the pope has been remarkably tight-lipped over the violent persecution of Christians in Bethlehem, instead choosing to condemn alleged Jewish "price tag" vandalism. On Thursday it was announced that 650 Christians from Gaza would be allowed to leave the Islamist-ruled enclave to travel to Judea and Samaria for the pope's visit. However, 20 priests from the Latin Patriarchate of Jerusalem, which presides over Arab Catholic communities in Judea and Samaria, wrote the pope a letter on Thursday, complaining that they had not been allowed to enter Jerusalem without IDF permission. "According to the State of Israel, the illegal occupier, we do not have the right to travel to Jerusalem without permission from the Israeli army," the Arab priests said in the letter. In the letter, the priests claimed the Vatican had given them passes to enter Jerusalem which Israel hasn't stamped with visas. The IDF monitors passage over the 1949 Armistice lines. "Jerusalem is becoming increasingly closed off to Christians from the West Bank," the letter added, calling for the pope to pressure Israel to submit on controlling passage on its own borders. The letter concluded "can the Holy Father be in the Holy Land without saying anything about the reality of injustice against an entire people held prisoner on its own land?" Another point of contention about the pope's visit is the status of the David's Tomb Compound in Jerusalem. While numerous government officials - including Foreign Minister Avigdor Liberman and Israel's Sephardic Chief Rabbi - have denied control of the holy site will be transferred to the Vatican, reports have revealed a plan to indirectly transfer the site. Rabbi Avraham Goldstein, the Rosh Yeshiva (dean) of the Diaspora Yeshiva located in the Compound, revealed what he said were much more underhand plans than a straightforward hand-over. "According to the information we have...the state will be allowing the Church to conduct Mass on the upper floor; then according to Jewish law (halakha) Jews will not be able to pray downstairs (either), since on the upper floor there will be idol worship," the rabbi said. Jewish law forbids benefiting from anything - including a structure or shelter - used for idol-worship. Catholic effigies and other rituals fall under the Jewish legal definition of idol worship, meaning that the establishment of a permanent Catholic place of prayer in the Compound would effectively prevent Jews from conducting their own services in the entire building. A Catholic official confirmed the Vatican's intentions to put those very plans into effect, telling the Salt Lake Tribune on Tuesday that the Vatican wants "to hold two hours of [Christian] prayer every day in the early morning before visitors start to visit it."